Agricultural income is tax free in India. This benefit is reportedly being misused by wealthy farmers with large incomes to evade taxes. ET Wealth reached out to experts to see if they feel the government should bring agricultural income under the tax net. It’s time to talk about the taxation of rich farmers, those who own more than 4 hectares of land. They form just 4% of the total agricultural households but hold over 20% of agricultural income. The latest National Sample Survey 70th round revealed that 70% of agricultural households in India have marginal holdings (under 1 hectare), and only 0.4% hold over 10 hectares. Even the proportion of agricultural households holding 4-10 hectares of land is just 3.7%. Just by taxing the incomes of the top 4.1% of agricultural households, at an average of 30%, as much as Rs 25,000 crore could be collected as agricultural tax. The agriculture sector has long acted as a tax shelter. According to data put out by the Income Tax Department, in the nine-year period from 2006-07 to 2014-15, 2,746, income tax cases declared agricultural incomes over Rs 1 crore. Agricultural income declared in returns filed up to November 28, 2014, for exemption in the 2014-15 assessment year, stood at Rs 9,338 crore. The exemption for agricultural incomes is benefiting medium and large farmers and agricultural companies, which was not the intended outcome. The incomes of the small and marginal farmers are far below the minimum threshold limit of Rs 2.5 lakh of personal income taxation. It’s true that agriculture is the main source of income for the majority of the rural Indian population. It is also equally true that while the small-scale farmers have been barely impacted by the tax exemptions under the Indian Income Tax Act, wealthy farmers have reaped the benefits by abusing them. There can be no easy answer to the question of whether agriculture income should be taxed, as it would have farreaching implications, as well as technical and legal challenges. It’s important to find the right balance between the taxing agricultural income and avoiding dis-incentivising the agriculture sector. The road to taxing agricultural income is not easy either. From a Constitutional standpoint, only the states are entitled to levy this tax. The prudent path to take would be to amend the definition of ‘agricultural income’ under the tax laws, and impose an appropriate monetary threshold after careful deliberation and study. Income that is not covered by this revised definition can then be subject to income tax. This would ensure that only the high-income farmers come under the purview of taxation, and the interest of small scale and mid-scale farmers is protected. Another alternative is for the parliament to formulate a model law law for the states to adopt, with a reasonable threshold and slab rates, much like income tax, to tax agricultural income. At 16.6%, India’s overall tax to GDP ratio is quite low. Therefore, there is a constant lookout for avenues to increase the tax collection. A regular point of debate is whether to tax the agricultural income, which continues to be exempt from tax. Any proposal to tax agricultural income will require the state governments. Given the political sensitivity, however, the states have been reluctant to tax this sector. The intent to broaden the base, check tax avoidance and to tax the ‘rich farmers’ while sparing the poor is well accepted. However, we need to consider if it makes economic sense to tax agricultural income at the current juncture. Given that the sector is still largely informal and driven by cash-based transactions with no account keeping framework in place, implementing an agriculture tax can turn out to be a major challenge. At a time when the Economic Survey 2016 computes the average income of a farming family in 17 Indian states at Rs 20,000 a year, on average 2,500 farmers commit suicide every year, all reeling under a growing debt burden, any talk of imposing tax on farm incomes is nothing short of a financial crime. In a country where 83% of the farming community comprises small and marginal farmers, trying to bring the entirity of agricultural income under the tax net is a bad idea. The biggest challenge today is raising the meagre income of farmers, and the Prime Minister himself has promised to double the same by 2022. As Parliament was recently informed, the total outstanding loan for the entire farming community stands at Rs 12.60 lakh crore. Already, Uttar Pradesh, Maharashtra and Punjab have begun the process of waiving farmer loans, and the pressure is building up for loan waivers in Rajasthan, Tamil Nadu, Karnataka and Maharashtra. The average income of farming family is less than Rs 1,700 per month in half the country. 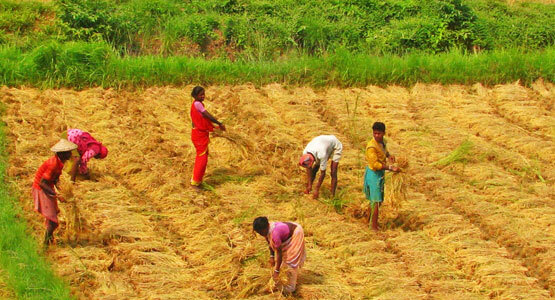 Taken together, the National Sample Survey Organisation computes the average income from agriculture to be around Rs 3,000 a month. Can this be considered a taxable income? Before the powerful chartered accountants’ lobby builds up the pressure for bringing agricultural incomes under the tax net, the monumental task at hand is to provide farmers with a taxable income.